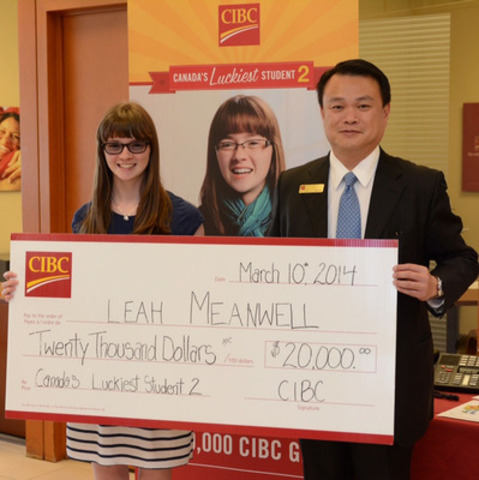 VANCOUVER, March 24, 2014 /CNW/ - CIBC (CM: TSX) (CM: NYSE) is pleased to announce the winner of this year's Canada's Luckiest Student contest is Leah Meanwell, a University of British Columbia student, who will receive the grand prize valued at over $55,000. Secondary and post-secondary students across Canada entered the contest through their Student Life Network account for a chance to win the ultimate student prize pack. That includes a $20,000 GIC from CIBC plus many other fantastic contest prizes, including free tuition and groceries for an entire year. "It's an overwhelming feeling, having the chance to finish my degree debt-free thanks to the prize money," says Ms. Meanwell, a second-year kinesiology student whose degree alone will cost $24,000 without factoring in living expenses. "Winning Canada's Luckiest Student contest means I can focus on my schoolwork, instead of how to afford my degree, and that's something I'm very grateful for." According to a report released last August by CIBC World Markets Deputy Chief Economist Benjamin Tal, roughly half of the students pursuing a Bachelor's degree will graduate from their program with debt and many won't start their career in good financial health. Last year's Canada's Luckiest Student was Taylor Esselment from Hagersville, Ontario, a psychology and criminology student at the University of Western Ontario in London. This marks the second year of the contest. The contest was run by Student Life Network, a Toronto-based youth marketing company that connects North America's top brands with millions of students across Canada. 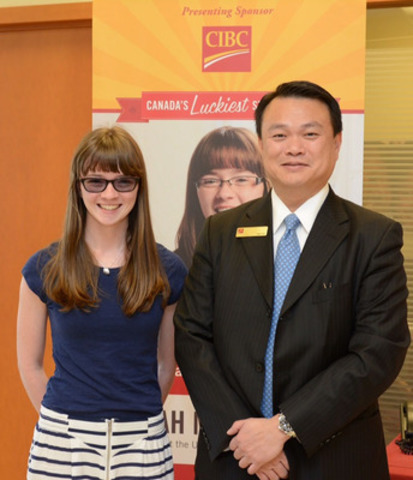 To learn how to save more through CIBC's student banking offers, including the CIBC student chequing account with unlimited transactions and no monthly fee, visit cibc.com/studentlife. Caroline Van Hasselt, Director, External Communications and Media Relations, 416-784-6699, or caroline.vanhasselt@cibc.com.